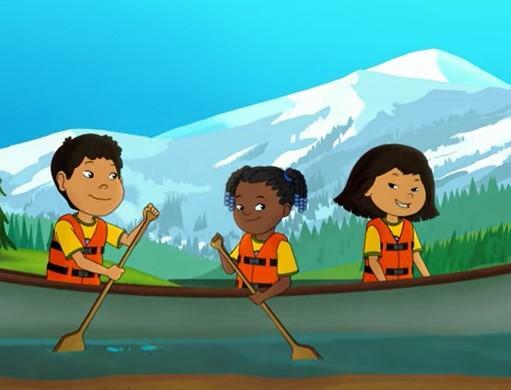 The upcoming PBS Kids TV show “Molly of Denali” features an Athabascan girl as the lead character for the first time on a national program. It is being produced by WGBH in Boston and Atomic Cartoons in Vancouver, Canada. But a big contribution of talent is coming from Fairbanks and Alaska’s Interior. Six Alaska Native scriptwriters are getting ready for the show’s release this summer. The adventures of Molly Mabray and her friends, who live in the fictional Interior Alaska village of Qyah, are the central themes of “Molly of Denali.” Producers are proud to claim it as the first nationally-distributed children’s series featuring an Alaska Native lead character. And they are working hard to have indigenous representation in the show – they have recruited six Alaska Native scriptwriters to join the team for the first season. Joe ‘Waats’asdiyei Apayuk Yates is Haida currently living in Fairbanks, and got to attend an intensive script-writing fellowship. He and the five other Alaska Native writers spent a week working closely with producers and animators at Atomic Cartoons in Vancouver. The Fellowship is funded by the Corporation for Public Broadcasting. The aim is to ensure that Indigenous people are authentically represented on-screen. Each fellow will write a script to be considered for the show. Molly is 11, but the animated action-adventure comedy is aimed at kids about 4-to-8 years old. Yates, who, as you can hear, has a one-year-old daughter, says working on the show is an honor. The show will premiere on PBS stations, like KUAC television, this summer. Aaluk Edwardson (Iñupiaq): an artist, playwright, educator, and actor from Utqiagvik who works at the University of Alaska Fairbanks Geophysical Institute. Anna Hoover (Unaangax): an award-winning filmmaker and project coordinator for the First Light Alaska project. She grew up in Egekik and now lives in Naknek. Frank Henry Kaash Katasse (Tlingit): an actor, playwright, and director living in Juneau. June Thiele (Athabascan and Yup’ik): an actor and playwright, who is originally from Alaska and now lives in Chicago. X̱ʼunei Lance Twitchell (Tlingit): a playwright, multimedia artist and associate professor of Indigenous studies at the University of Alaska Southeast. Joe ‘Waats’asdiyei Apayuk Yates (Haida): an award-winning documentary filmmaker and University of Alaska Fairbanks student. Alaska Native working group: Adeline Peter Raboff, Dewey Kk’ołeyo Hoffman, Luke Titus and Rochelle Adams. Language Advisors: Adeline Peter Raboff, Lance X’unei Twitchell, Lorraine David and Marie Meade.